You can also make an appointment to see Dr Paul Rees privately at The London Independent Hospital. 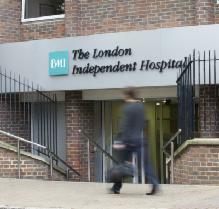 This fully-equipped acute hospital is well sited within easy reach of Central London, The City, Canary Wharf, Essex and the Home Counties. Dr Rees sees all general cardiology and general medical patients, with a special interest in the assessment of chest pain, coronary angiography, percutaneous coronary intervention and stenting, management of cardiovascular risk and assessment of patients undergoing major surgery. As well as seeing cardiology cases, Dr Rees is an accredited general internal medicine specialist, so will readily accept general medical referrals. Most referrals should be made through a General Practitioner, but direct referral can sometimes be appropriate. If you require an urgent appointment in Dr Rees's Heart Clinic, call direct on 020 8983 2413 or to email click here. Appointments can often be made the same day, or within 24 hours. This service is suitable if you are worried about symptoms of a heart condition such as chest discomfort with exertion, or an unusual degree of breathlessness. After a thorough consultation, some futher tests will usually be needed to help establish the cause, and the hospital has full access to on-site diagnostics. If you are worried about heart risk factors such as a family history of heart disease, if you have high blood pressure, diabetes or a high cholesterol, we can assess your risk of heart problems later in life. Working together, we can then put together a package of lifestyle and other therapies such as tablets, to reduce your chances of running into trouble in the future.